Applying the laser to various points on the body can facilitate weight loss by giving the person a feeling of well being which can suppress the desire for excessive and inappropriate food. The laser can also stimulate metabolism and thereby enable the body to utilize food efficiently instead of storing it as fat. Laser Concept offers you a number of different food plans to choose from or you may continue to follow any diet or exercise program you may currently be using. We do not prescribe any drugs or force you to follow any strict diets. A succession of three laser treatments over a three to six week period is recommended initially. 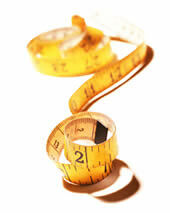 You may require additional treatments, depending on desired weight loss goal. NOTE: Before embarking on any weight control program, Laser Concept recommends contacting your physician.